Billy Graham tells a story that beautifully illustrates how faith necessarily entails trust, which is needed as we move beyond the belief of Step Two into the commitment of Step Three. To paraphrase the story: A brave man pushes a wheelbarrow back and forth along a tightrope suspended high above Niagara Falls. The crowd watches in astonishment as the agile acrobat continues to push the wheelbarrow back and forth over the deadly, roaring falls. Then the man places a 200-pound sack of dirt in the wheelbarrow and boldly makes his way across the falls, pushing the heavy load through the misty air. Making his way back, the tightrope walker points to a man in the crowd and asks, “Do you believe I can push a man in the wheelbarrow across the falls?” The excited onlooker says, “Yes, of course.” The acrobat points directly at the man and says, “Get in!” Step Three is about getting into the wheelbarrow. Most of us know intellectually that God can care for us a lot better than we can care for ourselves. But we may be afraid to trust God to care for us. We may have trusted other people who turned out to be untrustworthy. As a result, we might not expect any caregiver–even God–to be kind or helpful. Even though we may know that God is grace-full and loving, we may experience fear when we start to make the decision suggested by Step Three. Making a decision is all that is required of us in Step Three. It is similar to planning a vacation. First we decide to go on a vacation, then we start making plans for the vacation, and then we actually take the vacation. The decision is a very important part of the process–but it is not the whole process. In Step Three we are only making a decision. We don’t need to trust God completely and totally for the rest of our lives in order to do Step Three. We start by making a decision to turn our wills and lives over to God’s care today. It is a decision we will need to make one day at a time for the rest of our lives. Each day that we choose to entrust our lives to God’s care, our trust in God’s wisdom and love will grow. We have worked very hard to “find” our lives–to control our lives and to be in charge of everything we do. But the result has been loss. Jesus says that if we “lose our lives”–if we surrender our lives and turn over our lives to God–then we will find our lives for the first time. Some people–Christians in particular–may not see a need for this part of Step Three. Some have changed these words to read “through Jesus Christ.” It is understandable that those of us who are Christians would want to make that change. 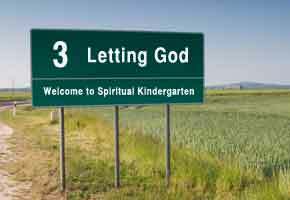 But it is also important to remember how useful it is to keep the door of spiritual kindergarten open for everyone. You do not need to have a complete understanding about God–or about Jesus–to benefit from this Step. We are still in spiritual kindergarten. We won’t get very far if we must pass an examination in theology before we make use of the Twelve Steps. The phrase “as we understood Him” does not suggest that we already know everything we need to know about God. Our understanding of God will change as we work through the Twelve Steps. The phrase “as we understood Him” means only that we act on the basis of what we have learned in Step Two–that God’s power is greater than our own and that God is powerful enough to restore us. That’s all the faith we need when we work on Step Three. It may seem to some people that this is just a little bit of faith. But as Jesus taught, God can do great things with a little bit of faith.